Each year Atlanta-area anime and gaming convention MomoCon selects five independently developed video games to honor in its Indie Games awards, and each year I help pick the winners. Here’s how games like The Banner Saga 2 and Talent Not Included made it into the top five this year. MomoCon (“momo” is “peach” in Japanese, Georgia is the peach state) has been running its game competition since 2015, when the rapidly-growing convention started to expand the video game portion of its programming in earnest. Developers submit their games for consideration. Once all of the entries are received, a separate panel of independent judges plays each game on the list, narrowing it down to a crop of 20 finalists. The 20 finalists receive complimentary space on the show floor to show off their games to convention goers during the show. Judging of the finalists takes place during the show itself. A selection of game journalists and the odd indie developer are sequestered in a hotel suite and tasked with playing and discussing the finalists. The goal is to narrow the field down to five by the time the Saturday evening awards presentation rolls around, hopefully in time to go out to dinner beforehand. We hardly ever have enough time for dinner. Before we get into the technical details, here are the 20 finalists for MomoCon 2017. 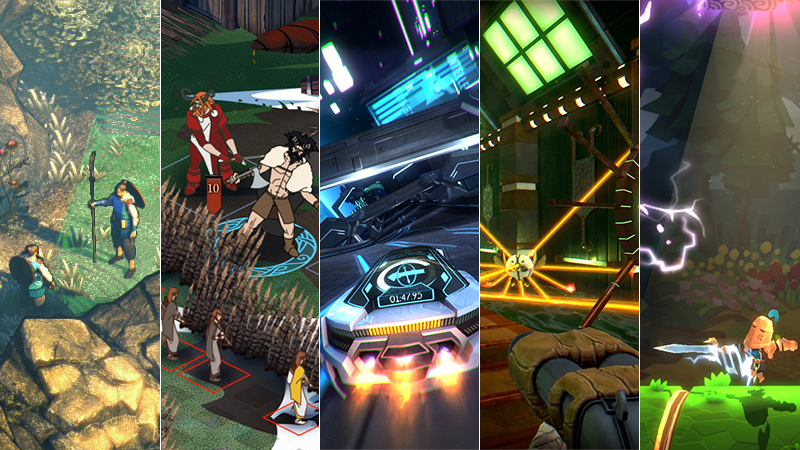 It’s a fairly broad list, covering some smash indie hits (The Banner Saga 2, Shadow Tactics) as well as more obscure fare (Talent Not Included, The Metronomicon). Some say the inclusion of bigger-name independent games was not fair to the smaller ones, but what are you going to do? Rami Ismail, founder, Vlambeer. He’s the odd indie game developer I was talking about. We ate snacks while he observed Ramadan. He hates us. Chris Carter, co-editor-in-chief, Destructoid. Despite what drunk Michael Fahey endlessly repeated on Friday evening of the convention, Chris has never killed a guy. Rob Manuel, editor-in-chief, Geek & Sundry. Rob wore a vest and a tie to the awards ceremony, while the rest of us wore whatever we had clean. Russ Pitts, former founding and features editor, Polygon, current co-runner of the TakeThis, a charity seeking to educate the community about mental health issues. Russ is secretly Paul Giamatti. Mitchell Saltzman, producer, IGN. Mitch is a real stand-up guy. I give him an 8.5. Chelsea Stark, editor, Polygon. Chelsea couldn’t make it due to plane issues, and was missed. Along with this fine group of gaming people, I spent many hours in a room containing four Alienware computers and a pair of iPads, playing each of the 20 finalists until we had a good grasp on what we did and didn’t like. When not playing we ate cheese, communally browsed Kickended.com, discussed the upcoming E3 and one of us may have accused the other of murder a couple of times. When time came to select the winners, we opted for a democratic process. First we went through the list, raising our hands to indicate a game we felt strongly enough about to vote for. That narrowed the crowd of 20 games down to a more manageable 9. Then came the serious discussion. Look at these faces, seriously discussing things. Clockwise from top left: Chris, Mitch, Rami, Rob, Dork, Paul Giamatti. One by one the winners fell into place. First came The Banner Saga 2, which was pretty much a no-brainer. Its inclusion in the finalists was almost unfair, but it fit the criteria, so there we were. Then came Shadow Tactics: Blades of the Shogun, another well-established indie hit that really nailed real-time tactics. One of the more unexpected inclusions was Crema’s Immortal Redneck, a Serious Sam-style shooter that really nails the classic first-person shooter feel. Frima Studios’ Talent Not Included is a very cool platformer that didn’t get nearly the attention it deserved when it was released on Steam last year. It’s a platformer as a stage play, with rotating cylindrical sets. It’s very cool, and very deserving. The only point of contention this year was for spot five. It came down to the sliding slasher puzzles of Slayaway Camp for PC and mobile, and the futuristic platform adventure driving of Refract Studios’ Distance. Ultimately the game with flying cars won out, but I would have been happy either way. Each of the five winners went home with $1,000 plus exhibitor space and a dedicated panel at MomoCon 2018. I’ll be there, sitting in a room, playing video games and occasionally accusing Chris Carter of murder.